The 68 one- and two-bedroom units at 50 Pine Street feature wide-plank hardwood flooring, slab quartz countertops and stainless appliance packages. Prospective homebuyers will have a chance to view 50 Pine Street at a grand opening event Oct. 27–28, where they can reimagine their lives in one of the 68 architect-designed homes. 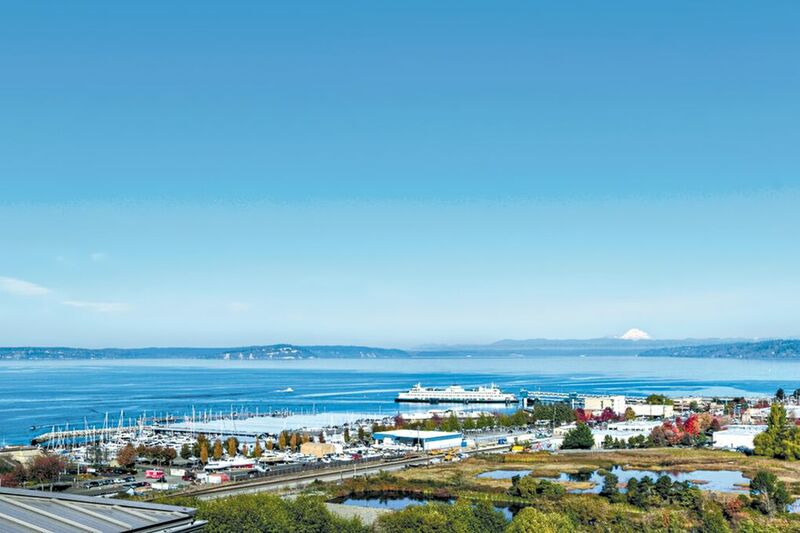 EDMONDS — From its perch on a bluff overlooking the Port of Edmonds and Marina Beach, a new community of luxury condominiums called 50 Pine Street offers sophisticated modern living along with breathtaking views of Puget Sound, Olympic Mountains and Mount Baker. Prospective homebuyers will have a chance to view this long-awaited property at a grand opening event Oct. 27–28, where they can reimagine their lives in one of the 68 architect-designed homes. The one- and two-bedroom units, some with patios and waterfront views, are priced from the $400,000s to over $1 million. Views from 50 Pine Street include Puget Sound, the Olympic Mountains and Mount Baker. Interior designs by Lisa Wiggins use modern finishes, colors and materials to create spaces of unique beauty and livability. Interior features include wide-plank hardwood flooring; and chef’s kitchens with slab quartz countertops, soft-close cabinets and stainless appliance packages. Living areas are designed with great room concepts, 9-foot ceilings and spacious windows for a light and airy feel. There are master en suites with walk-in closets, and baths with frameless shower doors and double-sink vanities. Wiggins is considered a perfect fit for 50 Pine Street, Marsh says. One of her trademarks is selecting finishing elements that can make a room live “larger” without using excess space. 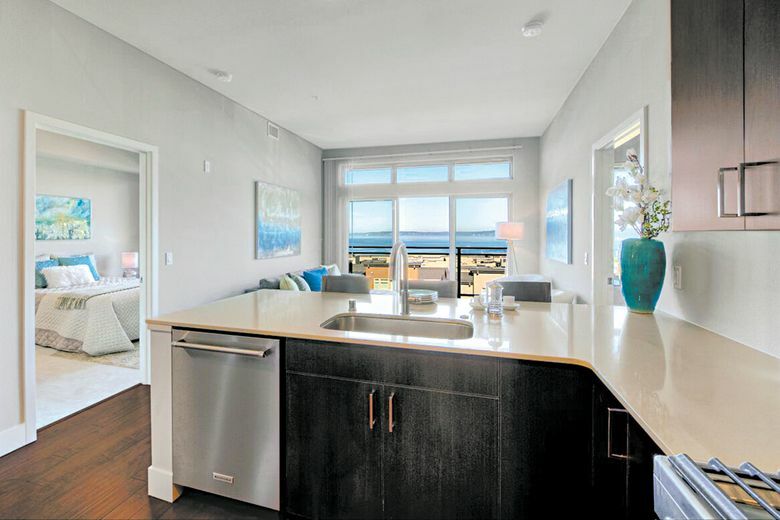 Perhaps the biggest treats in store for visitors at the grand opening event are the sweeping Puget Sound views coupled with living in the quaint beach town of Edmonds, according to Marsh, who is a longtime Edmonds resident. Residents at 50 Pine Street will enjoy ready access to Seattle and other work centers. “Edmonds is just 20 miles outside of Seattle by car or hop on the Sounder train for a relaxing scenic ride into the city,” Marsh says. And they will always come home to the unique charm of living in Edmonds. “There is an old-time charm that still exists here, from the city fountain, Christmas tree-lighting, antique shops to fine restaurants, boutiques, the iconic Edmonds Theater and the Edmonds Center for the Arts, all within walking distance to the city marina and sandy beaches,” Marsh says. Amenities at 50 Pine Street include a residents’ lounge and rooftop deck, where stunning views steal the show, along with an exercise facility and inviting outdoor fire pit patio. Parking is available for each unit, with 118 stalls at both street level and below-grade, with extra storage available for select units, Marsh says. With hundreds of people on the interest list at 50 Pine Street, available units are not expected to remain for long.